Solid Cottage Gates offer your home the protective surrounding but also the a beautiful compliment to the outside of your home. Our cottage gates are constructed to a very high standard. The timber boards are rough or planed in pressure treated timber. 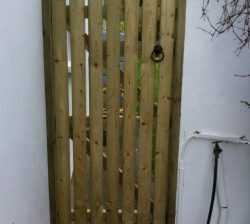 Solid Cottage Gates are 1.8m high and are priced at €50 per running metre for pressure treated rough timber and €60 for planed timber. No hinges or bolts are included. Click here for more information. As Irelands number one gate manufacturer, we have been supplying wooden gates for over 25 years. Abwood offers a vast selection of wooden side gates in many different width sizes. Click here for more information. Click here for more information and different styles of gates. 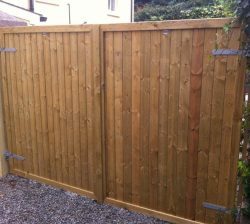 We offer a wide range of double gates available to our customers. Please see pictures of the different options available, all of our gates are made with pressure treated timber. Call our office today to get a price for supply only or we can arrange for our Abwood rep to call out to your house and give you an appropriate quote for supply and fit or if it is something off standard. 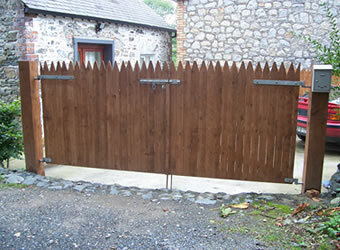 Please see pictures of double gates we have done for previous customers. Click here for more information. 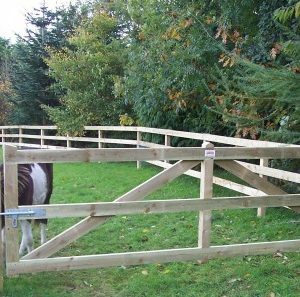 Field gates are made of pressure treated rough sawn 100mm x 35mm timbers and are as standard 3 bars /1.2mts high. Gates are priced at €75 per running metre with hinges and bolts extra. 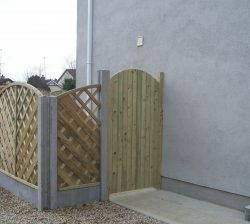 Field gates in planed 100mm x 35mm timbers are €95 per running metre.